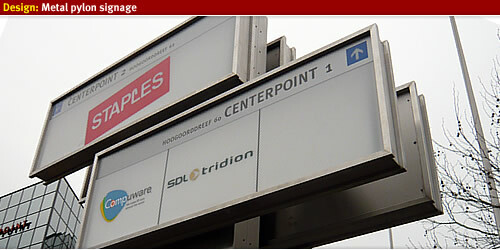 How to design an architectural metal pylon sign? 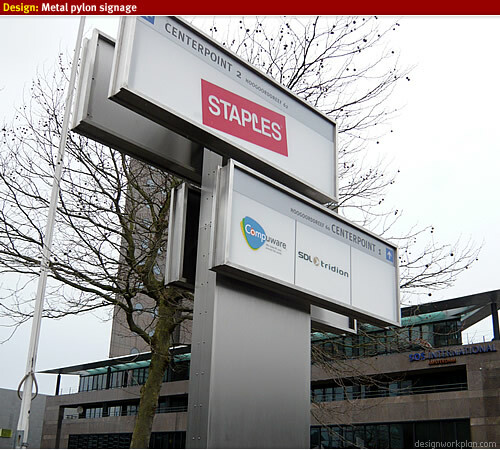 In 2008 my company BaumannSign we created a large metal pylon signage in front of an corporate building in Amsterdam, The Netherlands. 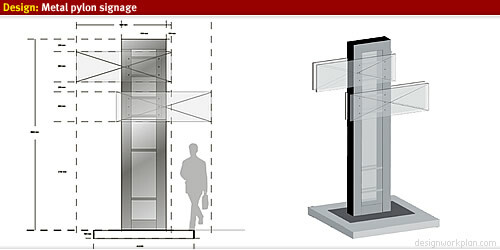 This article will give you an insight on how the pylon was designed, build and manufatured. Please let me know your findings on the final results. From several 3D angles the pylon signage was drawn and the internal elements were designed, I have had close contact with the client/architect and constructor to enhance all features and make no or litte design changes from the final design. After all details and the steel casing was drawn, everything was send to a construction ingenieur party to check if my calculations are according standards. When everything was approved and the placing request was granted from the commune, the build could be started. 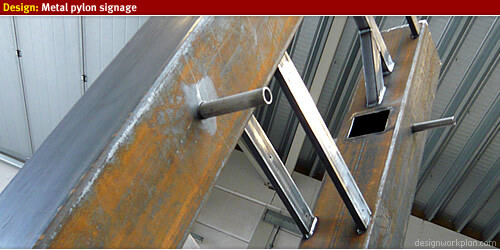 For all visual metal elements we used the material metal Stainless Steel Aisi 316 K320. In inside steel casing was made of square pipelines welled together and powder coated to reduce corrosion on the several parts. 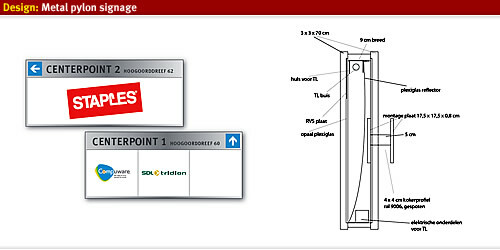 The pylon signage should be readable from a distance and the client requested to add the logo to the signs, this increases the recognizability of the companies in the office buildings. To create a unique look and feel to the landmark I added detail to the illuminated signs by a small stainless steel square border and let the plexiglas plate fall back a little, which will draw the attention by the detail. In inside illuminated equipment consits of a single TL-element mounted at the top of the sign, packed in a U-shape element the light is directed downwards. With a bend mirror-plexiglas the light is transported towards the plexiglas plate, allowing a high reflect diffus (white) effect. By using these elements not only you will get a high performance illuminiated sign but also reduce the costs of using just one TL-element. We have used white satin opaal plexiglas plates for a non-reflecting surface. At the location where the landmark was being placed a concrete plate was placed with a diamater of 2 x 2 meters weighing over 1600 KG. In this concrete plate several steel bolds where mounted with a chemical brace. 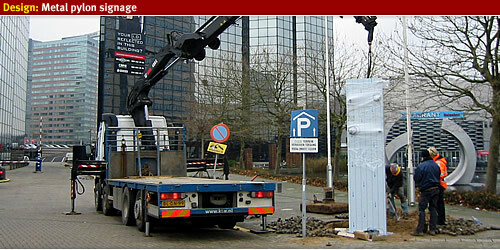 The landmark was then placed onto the bolds using a lifting element placed on top of the landmark. All the stones where placed back into position and the ground and the illuminated signs where placed into the fittings in the pylon. Our company very much enjoyed this project and we would like to thank the architect and all parties involved.